Hey baby, let’s go out for some….. Author DragonDonPosted on January 17, 2015 January 18, 2015 Format ImageCategories ContentTags coffee, innuendo, Korea, South KoreaLeave a comment on Hey baby, let’s go out for some…..
Ok, let’s take a break from all the hyped-nasty stuff and talk about coffee. Coffee is a huge hit here. So much so that when Canada’s national icon, Tim Hortons, came here, they decided against opening. I suspect it was due to the fierce competition that exists. When we lived in Seoul, we had not one but TWO major coffee chains in the first floor of our apartment building (Caffe Bene and Tom n Toms). within a one-block radio, there was 2 more major chains (Dunkin Donus and Yogerpresso). Add one more block heading towards the subway station and you can throw in yet another major coffee chain (Ediya). That means I can walk by 5 major coffee chains in a 3 minute walk to the train station! How the heck can you compete against that?? Then there are the coffee types themselves. See you can’t get a black coffee here, you can only get an ‘Americano’. Which is black coffee. The Koreans are genuinely shocked when I tell them they don’t call it Americano in America. “Really?” Oh I am so tempted to use that sheeple word again…..
And they also don’t use cream….ever. If you want a coffee with milk…well….watch this xtranormal video. That pretty much sums it up nicely if you walk into a coffee shop and want to order a ‘regular’ coffee. Here there is a lot of self-serve, so if you want sugar in your coffee, you go to the self-serve stand, add in your own (they also have this cool liquid sugar, I find it mixes quick and better). Don’t even think about asking for a ‘double-double’, you’ll just be greeted with blank stares. Remember when I did that post on coffee? Well not only are the Asians masters of mimicry, they will sometimes blatantly copy and spoof. I don’t even know if this was supposed to be real coffee! Being in Korea is it hard to not be able to walk a block or two to grab a Timmies. I at least was able to bring my Tim Mug to Korea with me. Many might ask why I wouldn’t bring some of the canned Timmies. Despite how well a coffee brewer might be, it never tastes the same. Tim’s sells a nice looking stainless steel ‘Tim Branded’ brewer, if seemingly overpriced. A recent understanding is that Tim’s coffee has it’s unique flavour due to the high-temps it is exposed too during the brewing stage and allegedly that is one of the reasons why Tim’s charges $125 for a brewer when you can easily buy one for $30 at a local Wal-Mart. This being the case, there is no way I could brew a decent cup of Tims while I am here without buying the coffee, the coffee brewer and a power converter to run the brewer. As much as I love my Tims, I can live without such an outrageous expense just to have coffee. Fortunately, Koreans love coffee too. I’ve already mentioned Starbucks as being the ‘Tims of Korea’ as I can almost give directions in the downtown core by Starbucks (unlike Tims in Hamilton where I can give you directions by Tims anywhere in the city….). This Starbucks is also 3 levels. 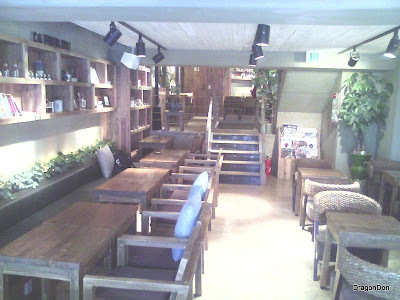 There are also a plethora of ‘Starbucks environment’ copy-cat places as well. Holly’s Coffee is nice but extremely strong, both in coffee and only slightly in price. Maybe I hadn’t had enough to eat when I tried it but later that night, my stomach was slightly upset. Perhaps it was the humongous cup of it or a combination thereof. 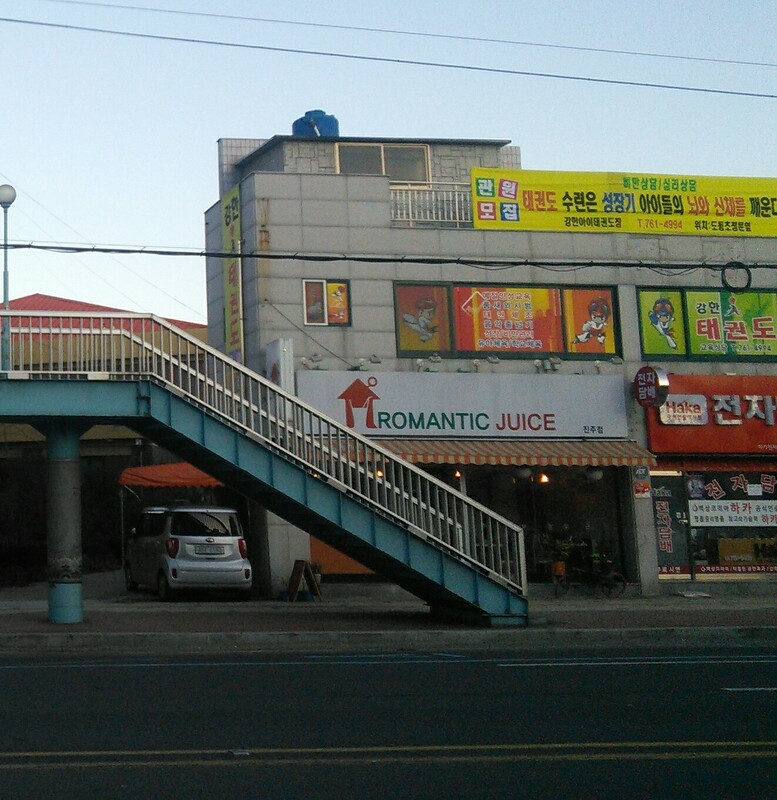 The atmosphere is pleasant, they have 2 floors and Wi-Fi is free. I wasn’t able to successfully connect to Wi-Fi with my netbook. I’ve noticed this on a few occasions so it may be some sort of weird Wi-Fi compatibility with my netbook and certain routers, or it maybe a crappy router they have. You also have Caffe Bene. Another place with only mildly over-priced coffee. I like the atmosphere here significantly more than Starbucks or Holly’s. They have bench seats along one wall with a comfortable cushion that runs the length. Wi-Fi is free and you can plug your portable device into a socket (as you can in any of these places). There is a 3rd floor but that is reserved for Smokers. (Side note: smoking is very common but slowly being phased out of public places. All western fast-food joints are non-smoking that I’ve seen thus far as well as public transit). Dunkin Donuts is another popular place and I’d say they would be next under Starbucks if you were counting popularity by brand. They have prices as you would expect as well as typical donut stock. They are about as close to a Tim Hortons as you can get here. I haven’t bought a coffee there yet, preferring some of the more fancy ones from either Starbucks or Cafe Bene. And then there are a quite a few other ones that are either individual cafes or smaller chains. Now, if those weren’t popular enough, Korea has something that would most likely be a hit for Tim Hortons (or any of the other coffee specialty guys). You can buy a can of hot coffee from any corner store….in a can. The corner stores have these little heated cabinets and a wide variety of coffees in typically two sizes. The ones pictured above are the smaller size. Starbucks is available as well as any other types from plain black to espresso with milk. The price for these shots are about $1 and are perfect for a ‘quick hit’ if you will. The cans are quite hot actually so holding them can be a bit of a challenge. For home, we have packets of pre-mixed coffee. These are pretty damn cool actually. I only have to add just a wee bit of sugar and a little bit of milk (more to cool it down than actual milk flavouring). This is, by far, the cheapest form of coffee. We bought a special box of 180 packets. Another side note about Korean packaging. Plastic packaging is meant to be torn and not ‘open’. For example, you would open a bag of potato chips and not tear off the top. Most packaging here you have to tear off a part to ‘open’ it. I have tried different packages and found it actually quite difficult to actually open as I normally would. Can be quite frustrating as you think to yourself “I’m not _that_ weak….sheesh.” but it’s just the way they do things here.